“Our workshop is a next step for you to gain some hands-on experience”. This is the subject of the Docker-workshop we did at Kabisa on Wednesday October 5th. We did a workshop for people who read about docker but wanted to get some hands-on experience. Because it can be hard to get started we did a demo to present the basics. This blog-post is a write-up of that demo. As our “test subject” we will use Ghost — a lean and mean blogging application using NodeJS on the backend and EmberJS on the frontend. How do we get an image on our local machine so we can run it? and check which port on the host we need to browse to. We don’t know this because we passed -P into the run command. This will map every exposed port on the container to a high and free port on the host. If we visit localhost:[port] we will see our awesomeblog. In Docker we always try to run one process in each container. That is why we are going to setup a MySQL container. Let’s visit Docker Hub again and search for mysql. The documentation shows we need to provide a couple of options when running MySQL. Let’s see if we can run MySQL. We don’t need to pull it first, it pulls when it’s not available locally. Now we are able to connect to this container with the credentials we passed into the run command. The -p option tells docker to map port 3306 of the host to 3306 of the container. So when we put the following command on the commandline, we can manage our databases. Be aware that Ghost (and maybe your app too) needs an existing DB and User. The MySQL user needs privileges to access the DB from another Host (container). We could start with a Dockerfile. A Dockerfile is a text document that contains all the commands a user could call on the command line to assemble an image. But this also means we could start the base image and do these steps manually. Let’s give that a shot first. We will use the –link option to tell our container to add a “network connection” to the mysql container and give it an alias inside this container of db. Because our new config only consists of the production part, we need to pass in the environment variable NODE_ENV=production. We create a new configuration file for Ghost (you can find config.js below) and we mount it inside the container. To check if this really works see if the application created the tables inside the DB of your MySQL container. The tasks called in this file are, getting the Ghost base-image and copy our local config file to the correct location inside the container (i found the original file inside the base image first). It will overwrite the existing file. The rest is copied from the base image Dockerfile, except for CMD, which now runs our app in production-mode. In the Dockerfile above, we copy two files into the container. Let’s have a look at these. Start Nginx from inside the directory with the nginx Dockerfile and both configuration files. docker build -t <dockerhub-user>/blogaboutit-nginx . Docker-compose, composes the different components of your application together into one working application. It handles building, running and connecting (networking) of containers. What does our compose file look like? 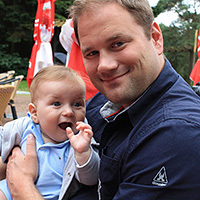 For more info please have a look at the Docker documentation. 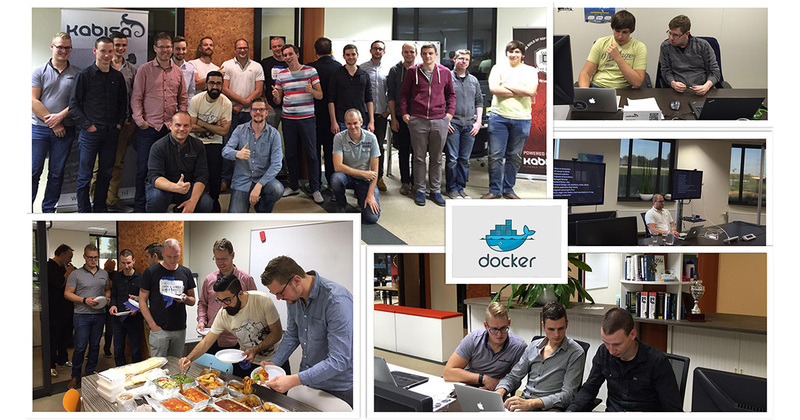 We’re big fans of Docker and we regularly like to share our knowledge through workshops or hackathons. They’re free and everyone is welcome! If you’d like to join us for our next online workshop, let us know and we’ll send you an invite when the next one is.